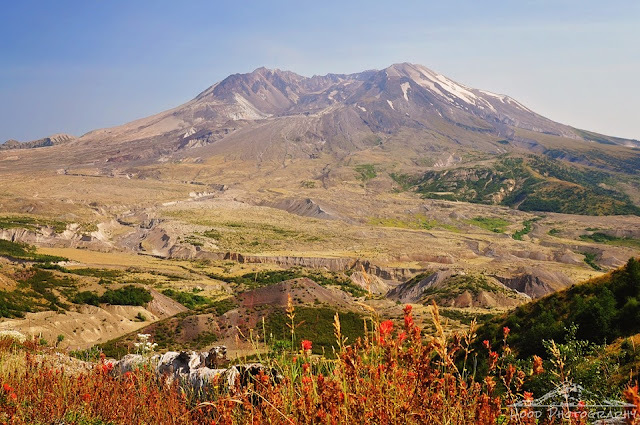 I visited Mt St Helens yesterday with family. I had not been in a few years, and am always amazed at the destruction that is displayed, and on the opposite hand, the regeneration of the area. Trees are growing again, the grounds are covered in greenery and wildflowers. It is a truly breathtaking sight. It was a very hot August, clear sky day in the Pacific Northwest yesterday, and the Indian Paintbrush and other plants were very dry. Gorgeous photo! Such a lovely expanse. Very pretty. The signs of natures strength and resilience is a humbling sight. Given time, nature heals. A beautiful shot of the mountain. I'd love to see it with my own eyes. Mother Nature is a rather tough character when it comes to regeneration. The mountain is spectacular. I find Mt. St. Helens awesome and terrifying at the same time.